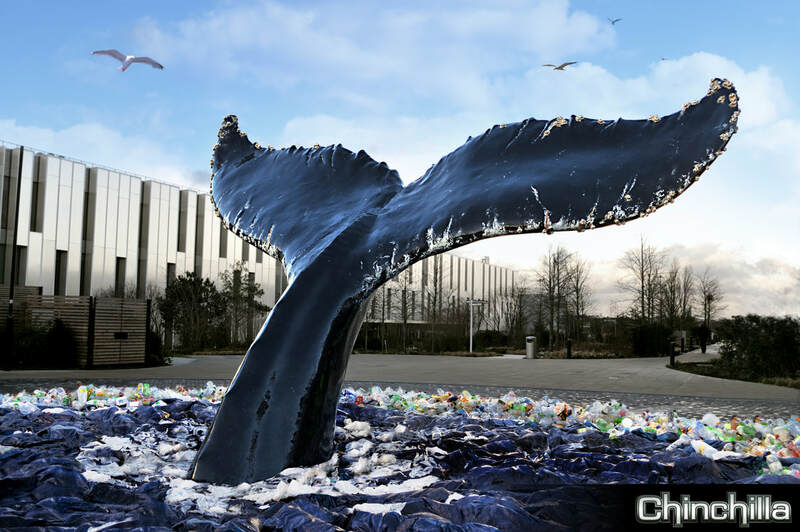 The sculpture also needed to be 95% recyclable, robust and durable for a 3-5year exterior installation. 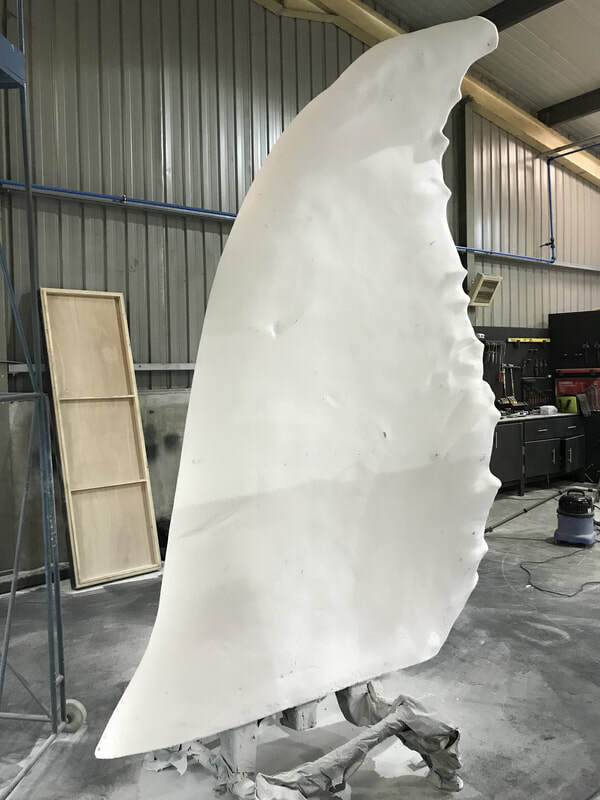 The Humpback whale sculpture needed to be anatomically accurate so trawling the web for images was the first port of call, alongside contacting the Pacific Whale Foundation (PWF). Greg Lawrence created the digital 3D sculpture on ZBrush and further research was required to understand why Humpbacks' breach the water: Between mating, defence, alarm calls, communication and fun the differences are there and although not visibly different in a big way we wanted to keep to the communication/fun shaping of the breach. There is very little information about Humpback musculature and in discussion with the PWF it was agreed good available reference of tail anatomy is the dolphin tail of which there is an abundance of reference. Using the Humpback skeletal reference available and the dolphin musculature, along with hundreds of reference images, the sculpture took shape and the PWF were ecstatic with the resulting anatomical digital sculpture. 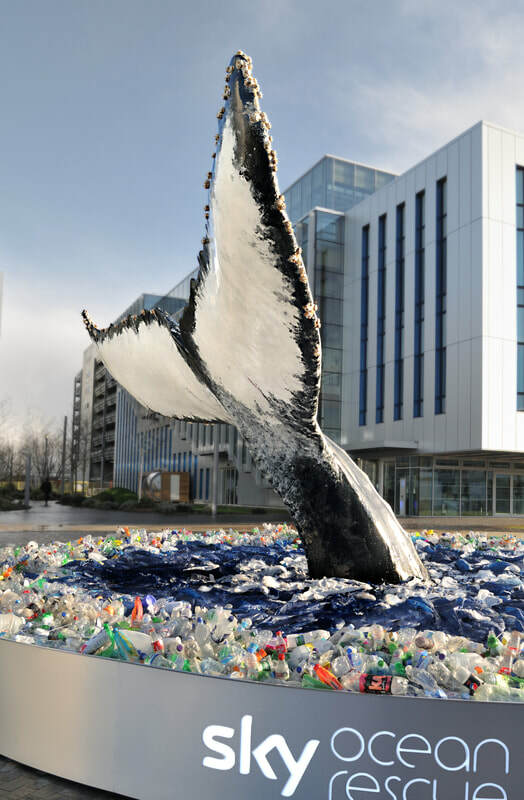 Because the whale would be installed outside at Sky HQ, structural engineers Conisbee and designers PBCS were brought on board to design structural steels to give the correct strength and support all the way to the very end of the sail-like flukes (fins or flippers) with each fluke measuring more than 3x2m. 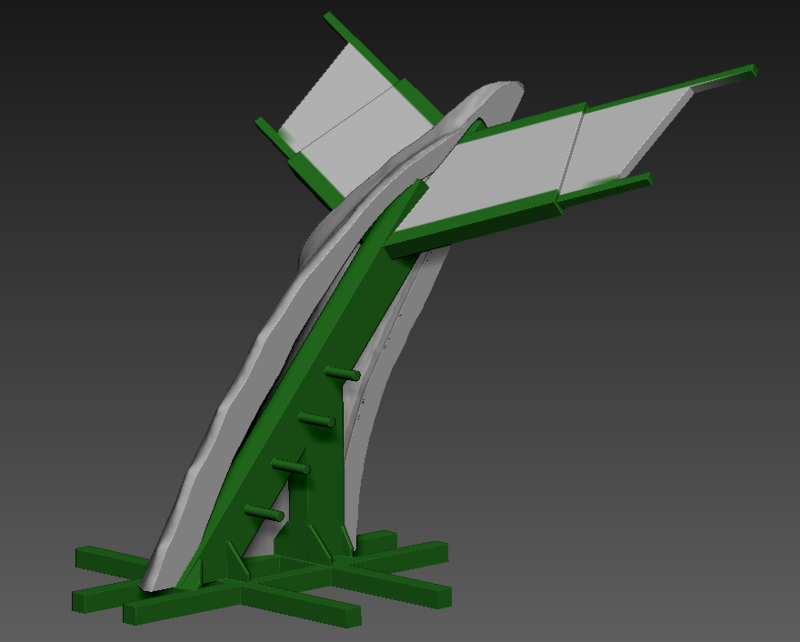 We can seamlessly work between 3D mesh and 3D CAD. 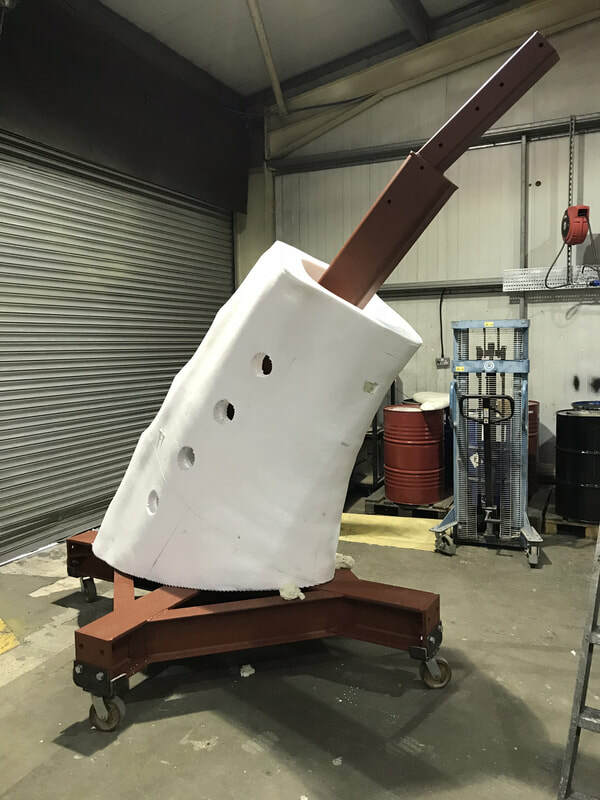 In this instance we supplied CAD of the internal cavities for PCBS to design the structure within and it meant we would be able to encapsulate it with our SuperHuge 3D print. "This is a prime example of how virtually constructing and coordinating a project in a digital environment can vastly improve the physical build phase. The irregular form of the sculptural part of this installation meant there was every possibility nothing would fit by the time the structural frame had been fabricated. But working directly with Chinchilla and sharing each other's sculptural mesh and structural steel models meant that both elements of the CAD phase progressed in harmony to provide an almost seamless assembly of parts both in the workshop and for the final install on site. 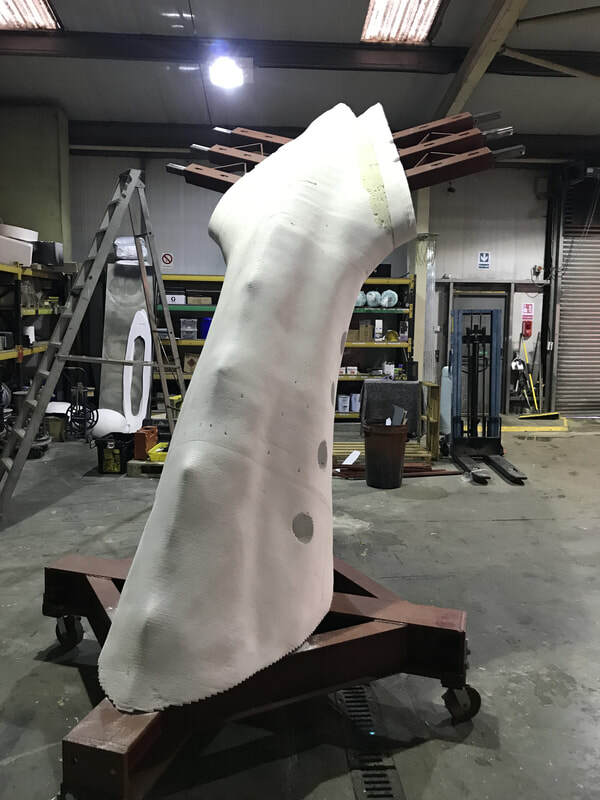 It has proved a big step forward in the design and production of complex, sculptural forms"
The high density polystyrene layers were fused together using our proprietary H-OLM system, then hand smoothed and assembled around the purpose-built steel structure. The polystyrene is light and fragile at this stage which makes for quick processing. Once the hard-coat is applied it adds an incredibly durable, impenetrable surface ready for any environment. Polyurea spray coating is 1-2mm of super-tough, durable resin which creates a class1 fire-rating and adding strength and longevity to the model. The coated elements are subsequently filled and sanded smooth ready for the creative paint FX. Once the whale was fully assembled, the realistic paint surface was applied - a combination of acrylic and specialist clear resins to give the wet look to the surface of the skin. Ten weeks from order to delivery. SuperHuge 3D printing saves time and gives peace of mind: The simplicity of working from a 3D file that builds around internal structure and fits the final location. 1. High quality digital sculpture was created, in this instance to impeccable anatomical accuracy. We’re talking feature film quality which is astounding. realism on the sculpture and in particular on the thickness of the flukes where internal space was extremely tight. 3. Production of the steel structure and SuperHuge 3D print started simultaneously saving enormous amounts of time. 4. SuperHuge is a one-of-its-kind technical system. But this is complemented with a fastidious design ethos by the entire Chinchilla team to make each and every sculpture exceptional. In my experience they design and produce above and beyond what is delivered anywhere industry-wide. The photos speak for themselves. The whale looks 100% real. What more could anyone ask for?" SuperHuge 3D printing uses up to 80% less material than traditional processes. Our print waste is 100% recyclable.